I already have a fairly important collection of Geocoins. I would like to look for some bookshelf or similar to be able to keep them. Any recommendation to buy it online? What kind of thing are you seeking? Here are search results for some styles of coin stands. Not all work well, unless your Geocoins are all pretty much the same size and thickness. Many of mine are not challenge-coin-style Geocoins, and the ones that are, have important info inside their flip-case. I'd have to index coins to their information slips if separated. If you settle on a display style, post a photo! I keep most of mine in a big ammo box. I'd consider displaying them in some way, but so far they seem to be doing OK, not displayed. Shelving for coin collections gives you a couple examples for sale. We keep ours in coin books, as a unit to hold a few hundred coins of varying shapes/thicknesses would sorta be a pain-in-the-can to work out. It'd only mean something to us, but would be in view to all. Dusting another consideration. I did make one for a friend once. Easy to use an existing shallow bookcase and groove a few shelves with a router. Easy to use an existing shallow bookcase and groove a few shelves with a router. That's a good idea! Or I might also consider attaching strips of wooden molding with the necessary gaps for a particular collection. 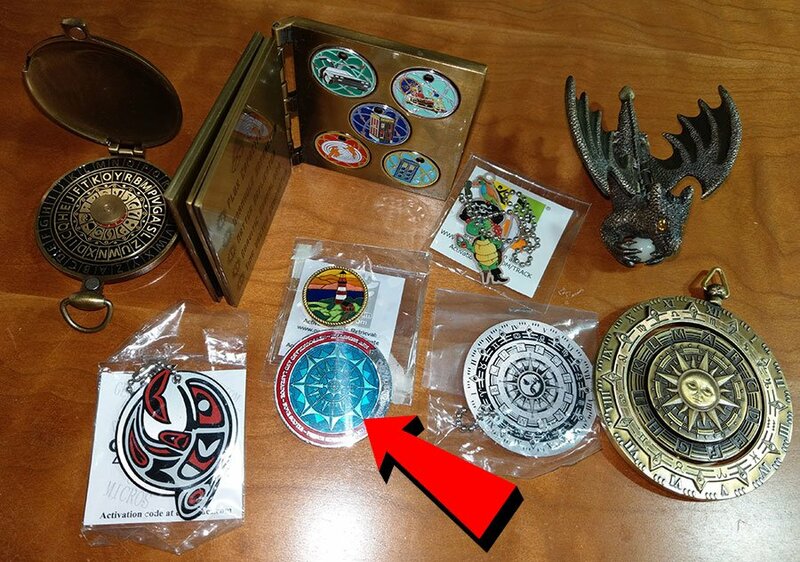 If you display Geocoins in any way where other Geocachers may see them, do you blot out the tracking number? Or do you activate them, so they're discoverable? Mine are cool (to me), but I have no intention of activating them for play. Rather than thin wood strips , I added various lengths of plastic, shallow snap teething rail edging for odd-sized ones. Upside down, screw them into the shelf, and the coins fit inside. Another 200+ unactivated, and they're the ones she feels she doesn't want to share. - She's lost some in the past at a geocoinfest ... crowded area, turned head talking to another, so she's careful now. All of mine are uncirculated, I think the only ones might be the full AT set anyone'd be interested in anyway. Geocoins are basically military challenge coins with tracking numbers. Plenty of options out there for challenge coin racks. Of mine shown here, the one with the arrow will fit great in a challenge coin rack. Fair point. I was thinking more the coin-shaped ones, but there are a lot out there that push the envelope. For the more creative ones, maybe a nice printer's type box? Yeah, and a glass face so I don't have to dust them. I haven't settled on a display (I kinda just keep them in a box ). But whatever I try, it would have to be capable of holding most any "Geocoin", especially since the weird ones are the coolest. But once I make my box, I'll have to start all over again after I get an even more oddly shaped big coin, from some Mega in Georgia that I like to attend. They hate me.